I’m excited to announce a special webinar taking place next Tuesday, September 20th at 9pm EST with brand and Facebook marketing expert Cj Ortiz. You are invited to this special, action packed FREE webinar titled: How To Build a Loyal Following on Facebook Without Losing Your Mind or Your Money. Let’s face it: Facebook is not going away. It’s still the Wild West for many when it comes to leveraging this social media channel to get and stay in front of key customers and to attract new prospects…C. J. is going to pull the veil back and show you how he builds his loyal Facebook following. We’ll also at the conclusion of this content rich weinar share how you can join Cj and me next month at the 6th Annual Mind Capture Boot camp in Grand Rapids, MI along with a few other elite marketing and motivational teachers. 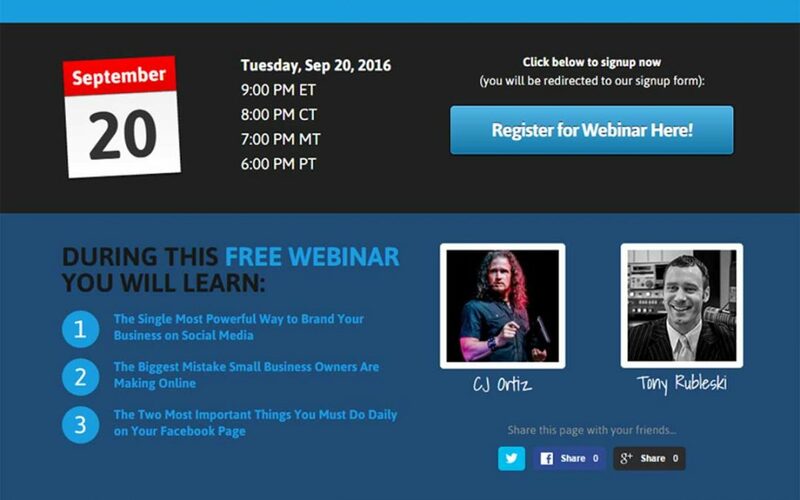 I’m excited to announce a special webinar taking place next Tuesday, September 20th with brand and Facebook marketing expert Cj Ortiz. You are invited to this special, action packed FREE webinar titled: How To Build a Loyal Following on Facebook Without Losing Your Mind or Your Money. We’ll also at the conclusion of this content rich webinar share how you can join Cj and me next month at the 6th Annual Mind Capture Boot camp in Grand Rapids, MI along with a few other elite marketing and motivational teachers.